When we were kids we spent a lot of time at our aunt and uncle’s house in the country. There were three things (among countless others) that we couldn’t wait for the most: swimming in the lake, singing jingle bells (no matter what time of year it was, a story for another post), and strawberry rhubarb pie! 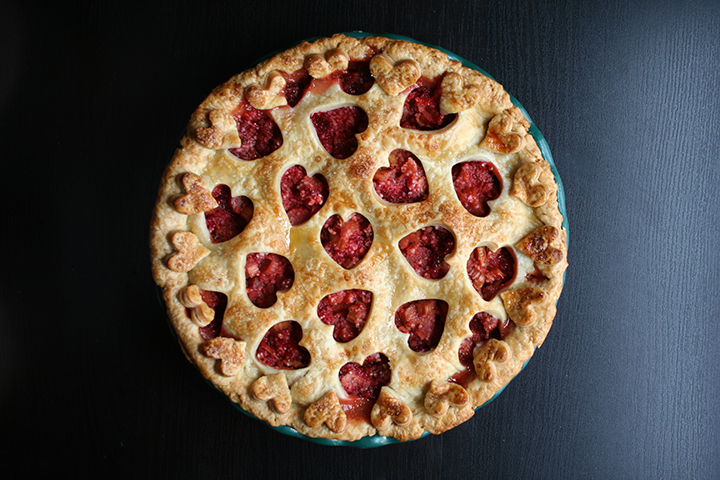 We love strawberry rhubarb pie and our aunt’s recipe is the winner, if you ask us. The sweet strawberries match up perfectly with the citrusy-sour contrast of the rhubarb. There is nothing fancy, whatsoever, to this recipe and that’s the beauty of it. This is the type of recipe you keep in your back pocket for whenever you have strawberries on hand and you happen to see rhubarb around… Our aunt would make several and freeze them to serve for the holidays. This recipe is perfect to make as is, or to use as a base for improvisation… and by now you know that we love improvisation! You can use the pre-made pie crusts that you find in the grocery store, but we strongly suggest making your own Double-Butter Pie Crust. It really makes a difference! For our most current rendition of this simple recipe, we adjusted the sugar to a 1/4 cup of granulated sugar and 3/4 cup of brown sugar, which added a more complex molasses flavor. We also added 1 teaspoon vanilla extract, replaced the orange with 1 teaspoon lemon rind and 1/2 the juice of the lemon, and added 1 small tart apple (Golden Delicious), grated. The lemon and tart apple worked perfectly in contrast with the added depth from the brown sugar. 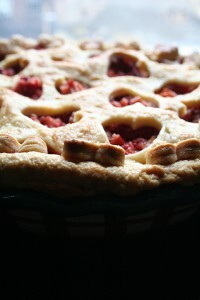 Now some people are weary about rhubarb, but rhubarb stalks make an amazing pie filling and this tart vegetable also works well in savory dishes (try serving it as a side dish sauteed with onions, garlic and balsamic… yum!). And yes, you read that right, rhubarb is a vegetable! 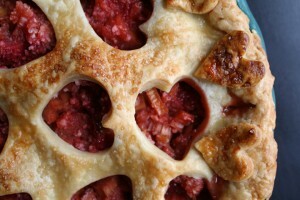 Rhubarb is in season from late winter to early spring with its peak season from April-June. When picking out your rhubarb from the grocery store, farmers market, or on your own, look for thin, red, crisp stalks. If the stalks are floppy they are old and are no longer in their prime. To store your stalks, wrap them in plastic and refrigerate for up to a week. If you are going to be using the stalks within one day, put the cut root end in a little water and keep them on the counter top. Oh yeah… an important note to remember, only the stalks of this plant are edible, the large fan-like leaves are poisonous. Our aunt always used instant tapioca pearls in her strawberry rhubarb pie, and after some experimentation with some other options we believe it’s the answer to runny fruit juices! The typical standby thickeners, flour and cornstarch, have on occasion produced a soupy texture for us, with the pie overflowing with those precious and tasty juices. Tapioca pearls have become our choice to thicken almost all of our fruit pies, and if you’re not a fan of the pearls put them in the food processor and pulse a few times. It is the same great thickening agent, without the texture! If you’re not a tapioca pearl fan, or just don’t have any on hand, the runner up that we have had success with is arrowroot starch and a small baking apple – grated. But if you only have flour or cornstarch on hand, just go for it! Have ready and refrigerated one pastry lined 9-inch pie pan and pastry one round. Toss together strawberries, rhubarb, sugar, tapioca and orange rind. Pour the filling into the refrigerated pie shell, arrange the pastry round on top, crimp pastry together, and pierce top of pie in several places around to allow steam to escape. Meanwhile, position the oven racks in the bottom and center positions, place a rimmed baking sheet on the bottom rack, and preheat the oven to 425°F. Brush the pastry with the egg wash and sprinkle with desired amount of turbinado sugar. 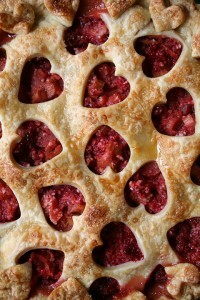 Place the pie on the rimmed baking sheet on the lower rack of a 425°F oven and bake for 20 to 25 minutes. Then lower the oven temperature to 375°F, move the pie to the center oven rack and continue to bake for another 35 to 40 minutes, or until the pastry is a deep golden brown and the juices are bubbling. If the crust is browning to fast place strips of foil around its edges. Allow to cool. Serve slightly warm or at room temperature.